I picked up a couple of Oriel Ynys Môn (The Anglesey Gallery) booklets for our guests, then one for me: I’m in this one and who can resist a picture of themselves in a publication. My exhibition, ‘Textiles in Transition’, runs from 25th April to 7th June. I’ve nearly finished all the work and I’m making lists and trying to sort out prices (the hard bit!). I’m beginning to get a bit excited – there’s nothing like seeing your own work hanging in a lovely gallery. Pick up a booklet and come along to see my exhibition. 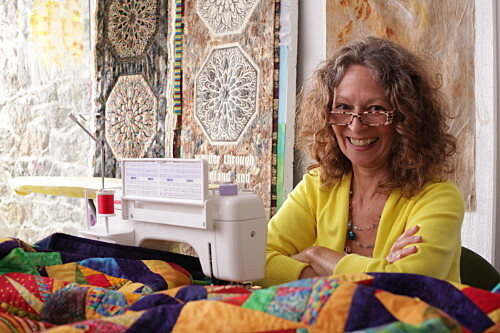 Better still, come to one of my One or Two day Workshops and start to learn about Textiles, particularly Patchwork and Quilting – I have to warn you though, it’s addictive! Today was fun. Daf and I popped out to a new café in Bangor, opened just two days ago by an acquaintance of ours, Lesley Wills – she’s also a personal trainer with much more than a passing interest in nutrition. The big news is that the café is totally gluten-free and serves the best coffee (Poblado – roasted in Groeslon! – really, look it up!) and very tasty, fresh, healthy food. What more could you ask for? Don’t worry if you’re not gluten-free – the food still tastes as good – try it. 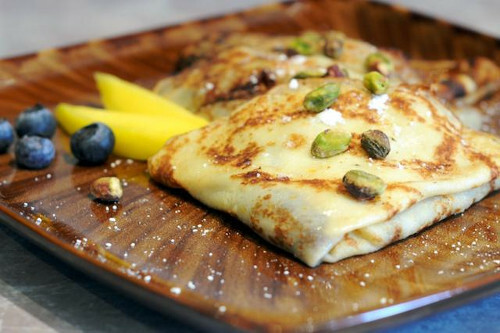 Crepes with lots of good ingredients and no guilty conscience! What’s not to like?! This entry was posted in Blog and tagged Anglesey gallery, Dorothy Russell textile art exhibition, Oriel Ynys Mon on 11 February, 2015 by admin.